There can be up to five hydraulic connections to your final drive motor or travel motor, and this is true whether you have a mini-excavator, skid steer loader, or compact track loader. 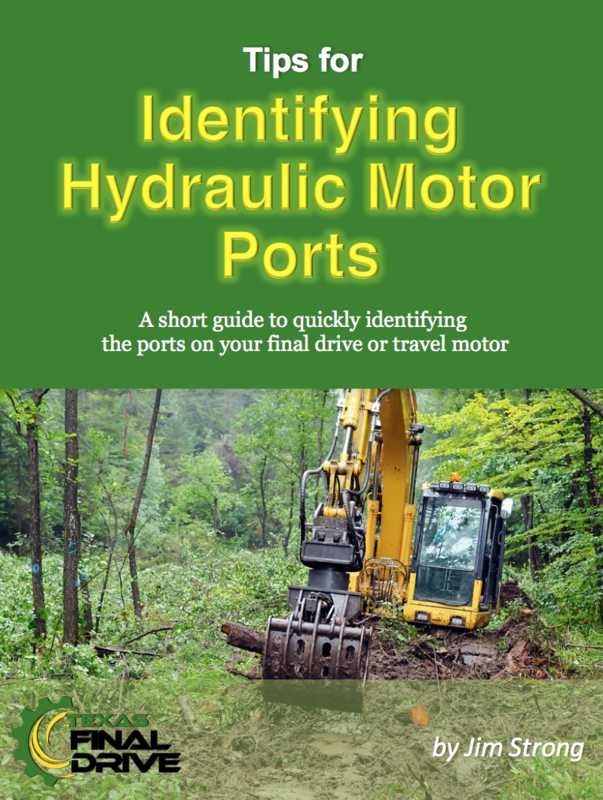 In this Shop Talk Blog post we will discuss each hydraulic port, including how to identify them and what their purposes are. A typical final drive motor will have 2, 3, 4, or 5 hydraulic connections. A minimum of two hydraulic ports will always be present. 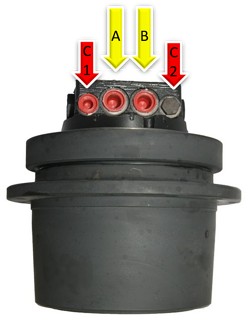 These are the flow and return ports, and the lines that connect to them provides the hydraulic fluid and pressure to the motor. The flow and return ports are typically going to be the two ports with the largest diameter and will connect to a matching pair of steel pipes or rubber hoses. If more than two ports are present, one of the lines will most likely be a case drain line. 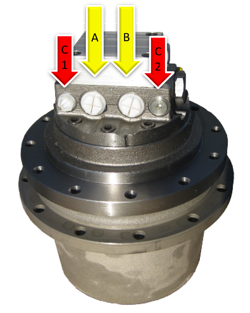 All piston-type hydraulic motors are going to leak hydraulic fluid from the rotator group. This is a good type of leak: it is used to lubricate the piston shoes, the swash or thrust plate, and the area between the cylinder block and the valve plate. This hydraulic fluid must be returned to the hydraulic tank under minimal pressure. That is the purpose of the case drain line, which runs from the travel motor to the hydraulic tank. Note that this is a low pressure line and is where you will find the case drain filter, which we have discussed in other blog posts. Note that if there are only three lines, the smallest one will most certainly be the case drain line. Some travel motors actually have two case drain ports present and they are interconnected, meaning that either one can be used. You always want to use the highest case drain port on the unit due to air circulation of the motor: if you don’t use the highest one, you will have cavitation in the motor because the air cannot escape. Cavitation is never a good thing. If your motor is a two-speed model, a two-speed port will be present. As its name implies, a two-speed port controls the speed of the travel motor. The speed line will be the smallest line of all. Note that hydraulic fluid only flows through the speed line when the machine is set to high speed mode. The speed line connects to the speed port, which is going to be the smallest port and may be on the back side of the travel motor or final drive. A brake line port may also be present and will be on the side or behind the main housing. This is one of the smaller lines, and should only be pressurized when the travel lever is in operation. The final drive motor shown above has two ports for the flow and return lines (marked A and B) and two case drain ports (marked C1 and C2). Notice that the flow and return ports are significantly larger than the case drain ports. Here is another final drive motor with the flow and return ports in the center and the case drain ports on either side. In this one you can clearly see that the case drain ports require smaller lines than the flow and return ports. 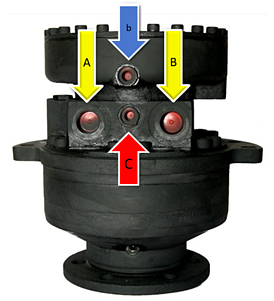 For our final example, this travel motor includes the brake port (highlighted with a blue arrow and labeled b). You will notice the case drain port is located between the flow and return ports. With up to five different lines connecting to your final drive, it can get confusing when it comes to figuring out which line connects to what port. We know this can be challenging whether it's an installation of a new final drive or maybe you decided to fix a final drive and know it needs to be reinstalled. We trust that this review is helpful. If you ever have trouble identifying the lines, remember that you can give us a call. Finally, many of our customers will use colored ties to identify the hydraulic lines and make it easier to install a new, repaired, or reman final drive.